Jesus was traveling from Judea to Galilee. Tired, hungry, and thirsty, he and the disciples arrived in Sychar, a Samaritan village in the shadow of Mount Gerizim. While the disciples went to buy lunch, the Lord sat alone beside the well. 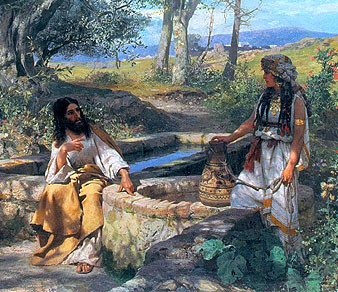 When a woman came to draw water, Jesus asked for a drink. Astonished, she said, “How is it that you, a Jew, ask for a drink from me, a woman of Samaria?” (John 4:9). Painfully familiar with troubled relationships, this woman expected Jewish men to ignore her. Racial and gender prejudices were strong. But this stranger was willing to drink after her, to put his mouth where hers had been. Intrigued—first by his openness and then by his uncanny knowledge of her personal history—the Samaritan woman posed a religious question important to her: “Sir, I perceive that you are a prophet. Our fathers worshiped on this mountain [Gerizim], but you [as a Jew] say that in Jerusalem is the place where people ought to worship” (John 4:19-20). Were her people right, or were the Jews right? Where did God expect the temple to be? The answer startles her. “Woman,” Jesus says, “the hour is coming when neither on this mountain nor in Jerusalem will you worship the Father. 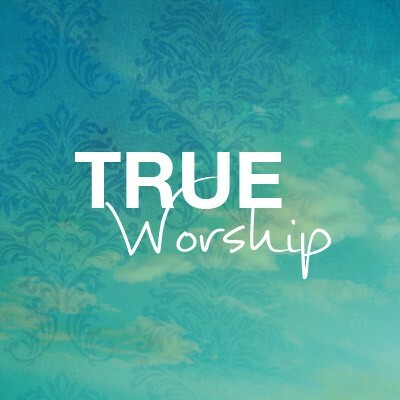 […] The hour is coming, and is now here, when the true worshipers will worship the Father in spirit and truth” (John 4:21, 23). Sadly, many church-goers never seem to grasp what Jesus is saying. With their mechanical instruments, choirs, robed clergy, and splendid houses of worship, they attempt to recreate the Jerusalem temple experience. But the appeal of Christian worship is its simplicity. Free of instrumental music and all the other trappings of temple worship, the church can gather in any setting—no matter how humble—and offer up pleasing worship to the Father. What matters to God is that our assemblies be truly spiritual.